By Ed Sullivan— Enterprise networks around the world are becoming progressively choked by the integration of bandwidth-hungry Internet-based applications. The growing usage of streaming video content, integration of digital voice services into the LAN, video conferencing and other online activities not only contribute to the enterprise bandwidth dilemma, but also can pose significant security issues to conventional copper based networks. With dramatically increasing demand for bandwidth among user populations, many enterprises are finding the right data communications solution is the passive optical LAN (POL). Essentially composed of point-to-multipoint fiber conducted through unpowered splitters, POLs are telecommunications networks that enable enterprises to simultaneously converge multiple services such as data, VoIP, video, building security and management services and wireless devices. Also, compared to conventional copper-structured cabling, POLs offer significant “green” incentives, a much smaller cabling footprint, and a futureproof architecture that can grow with bandwidth demand. “Many users of fiber-optic cable services such as Verizon’s FiOS in their homes or businesses are, perhaps unknowingly, quite familiar with the basic benefits of the POL,” explains A.G. Melson at Optical Cable Corporation (OCC). “Because these cable TV providers have fiber-optic backbones that can travel great distances without a degradation of signal [which occurs with copper-based cable], they can deliver higher-bandwidth services such as high-definition TV, high-speed Internet, and digital telephone—individually or bundled,” Melson explains. OCC is a manufacturer of a broad line of data-communication cabling and connectivity solutions. In the POL arena, the company offers specifically designed products to cover the entire network “signal path” from the OLT (optical line terminal) all the way to the ONT (optical network terminal) next to individual users’ workstations or desktops. [Native Advertisement] Melson likens POL technology (also referred to as a Passive Optical Network, or PON) to a FiOS-type architecture routed throughout a building or enterprise campus, rather than a residential neighborhood. The singlemode fiber network backbone is connected to splitters, each of which will provide fiber to 32 “customers.” In total, a single POL can be connected to hundreds or even thousands of individual users, providing them with a multitude of enterprise and outside telecommunications applications. Industry suppliers project that in the not-too-distant future between 10 percent and 30 percent of population of conventional LAN architecture will move toward POL. The typical POL network will serve 200-plus users. The benefits of POL are many, and should encourage enterprises such as universities, hospitals, corporate campuses, and multi-dwelling units—any facilities with relatively high-density populations of users—to install or retrofit this architecture. POL over singlemode fiber represents a major bandwidth upgrade for enterprise networks currently operating with 1- or 10-Gbit connections to the desktop. Also, singlemode fiber reach for POL is in the 10- to 20-kilometer range, whereas conventional copper architecture is typically limited to a 100-meter channel. Timmins adds that CapEx and OpEx advantages are significant as well. POL is significantly less costly than copper-based LANs. Investments in wiring closets and associated electronics are eliminated as well as climate-control costs. Installation costs are reduced because the fiber cables are less expensive and easier to install. POL flattens the LAN by reducing the number of switches and routers on a network by connecting devices to a single switch rather than separate switches. Reaching multiple users with each fiber gives POL flexibility not present when compared to copper-based LANs. This architecture also addresses the “green” initiative and saves on costs at the same time. There is no electric power requirement for electronics between the OLT and users. The need for a telecommunications room, or wiring closet, is replaced with zone enclosures, eliminating the need for a closet cooling system and reducing power consumption. POLs are also considerably more secure than legacy Ethernet networks. They are free from crosstalk and interference. Conventional Ethernet LANs emit electromagnetic signals that can be intercepted. POLs, which contain all optical fiber, do not. They are non-flammable and require no EMI or RFI shielding. Plus, the POL supports security mechanisms such as AES (advanced encryption standard) 128-bit encryption. Generally speaking, POLs are easy to install because they are simple—consisting mainly of fiber optics passing through splitters that deliver services to the user faceplates (to which their equipment is attached). Also, pathway space requirements, such as the headspace over drop ceilings, are reduced significantly. A typical POL “zone” configuration is made up of an MDF (main distribution frame) that runs fiber to a zone distribution enclosure, typically mounted in the ceiling. 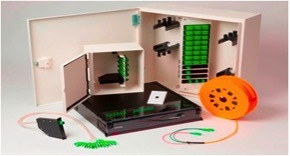 The zone distribution enclosure contains splitter cassettes (1 to 32 splitters) from which fibers are run to the user via the ONT (optical network terminal). A copper patch cord connects the ONT to the user’s Ethernet NIC (network interface card). Some suppliers have developed proprietary POL devices to enhance ease of system installation. For example, OCC has developed two ceiling-mount zone enclosure versions. A standard model, which supports up to three, 1-32 splitters, is 8.5 inches deep. A low-profile model, only 4 inches deep, is available for areas where there is less headroom above drop ceilings (due to air conditioning ductwork, fans etc.). The latter model supports a single 1-32 splitter. The company also offers a small wall-mount enclosure for a 1-32 splitter for enterprises that require some additional ports after the initial POL installation. This model features removable adapter plate components for easier installation. Ed Sullivan is a Hermosa Beach, CA-based writer, who has written about high technology, healthcare, finance and real estate. This article was written on behalf of Optical Cable Corporation.